Thanks Swamp Queen, let me know of changes that you want to make. A Christmas Brunch Recipe made with a southern staple. Make ahead and ready when your crowd is. Also great for dinner with fish, ham bacon and etc. Bring grits, chicken broth, and next 3 ingredients to a boil in a medium saucepan over medium-high heat; reduce heat to low, and simmer, stirring occasionally, 4 to 5 minutes or until thickened. Stir in butter and cheeses until melted. Gradually stir about one-fourth of hot grits mixture into eggs; add egg mixture to remaining hot grits mixture, stirring constantly. Pour grits mixture into a lightly greased 2 1/2 quart baking dish. Bake at 350 for 35 to 40 minutes or until golden brown and bubbly around edges. This hearty soup combines two lucky foods, black-eyed peas and collard greens, with vegetables and smoky ham. Enjoy on New Year's Day, or any day, for a satisfying, warming meal. Serve with thick slices of toasted crusty bread. Hey gren, on the dip you added for me, I don't microwave it, I do it all on the stove in a pot after cooking the meat. I suppose one could microwave it like that, but that's not typically how I do it. Added the microwave as an alternate method. My sister's recipe . She died of cancer but was a diehard Gator fan. Crumble up corn bread and add the saute'd mixture. Then add remaining ingredients and mix well. Place in baking dish and bake @325 for 30 to 45 minutes. 2. Crumble up corn bread and add the sauteed mixture. 3. Then add remaining ingredients and mix well. 4. Place in baking dish and bake @325 for 30 to 45 minutes. 2. in 1 quart of water for 40 to 50 minutes. Discard celery, onion and gizzard. 3, Chop liver and neck meat and return to pan. 4. Add chicken broth or if you have a turkey, use drippings (about 1 1/2 cups and 1 can of chicken broth). Yeah this looks pretty good to me too. Think I might try to make it soon. A few years back we developed a condominium project on Edisto Island near Charleston. There was only one gas station on the island and this old black woman ran a restaurant inside and she was a hell of a cook. She was a Gullah, a direct decendant of the African slaves that were bought and sold through the slave market in old Charleston. She made a fried grits dish that was awesome. 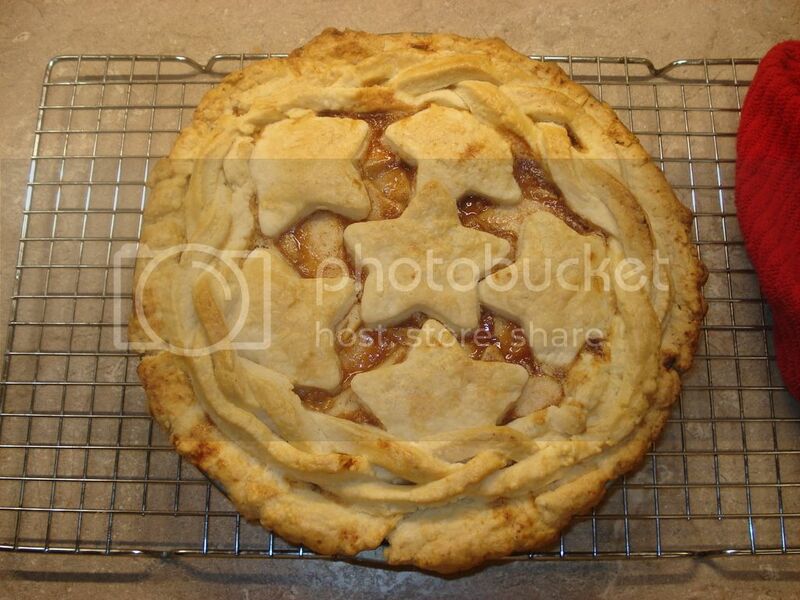 I made an apple pie tonight. The crust was a little different than one I'm used to making. Rather than using butter, lard. or shortening it called for vegetable oil which meant I didn't have to cut the fat in. I haven't cut it yet because it's a little late. If it turns out ok I'll post the recipe. I was going to do a lattice crust but I rolled it too thin and it kept breaking on me so I just rolled a top crust. OK the apple pie I made last week wasn't what I hoped for. It looked good but in fact it was awful. The crust was heavy and the filling was undercooked, even after being in the oven at the start at 475 and then reduced after about 15 minutes to 350 for another 45 minutes. This time I cut in about 1 3/4 cups of lard and cold water with about a teaspoon of white vinegar. The apples I used last week were Granny Smith and although they were real beauty's they were tough and chewy. Tonight I used a regular 9" metal cake pan instead of the deep dish ceramic cookware and used 4 Red Delicious apples. I pre-cooked the filling long enough for the sugar, flour and cinnamon to melt and the sliced apples to soften and then added the filling to the crust. It's after midnight now so I won't cut it until tomorrow. That chowder looks good. Anytime you put a pound of bacon and corn together it's gotta be good, but It looks to me like it wouldn't all fit in a crockpot. I might try that in a larger stock pot and maybe add some Grands on top or a cornmeal dumpling. I gotta have bread. I just ate a huge piece of the apple pie with some Cool Whip and unlike last weeks recipe it was marvelous. The only change I would make would be to add some sprinkles of Turbinado sugar on the crust after the egg wash.
That's a little over 3 qts of liquid so I think that you would need at least a 6 qt crock pot. I would fry the bacon in a large stock pot and then start adding ingredients and skip the slow cooker but that's just me . Wife made me a mango pie last year for my birthday. Several chatters asked for the recipe. Prepare crust by mixing together flour, sugar, salt and lemon zest. Cut butter and shortening into small chunks and add to the dry ingredients. Mix until the dough holds together in small crumbs. Sprinkle ice water over mixture and mix until the mixture holds together in balls and press together. Divide the dough into 2 equal parts. Refrigerate for at least 30 minutes. Roll out half dough and fit into 9-inch deep-dish pie pan. Weigh down the crust with rice, dry beans, another pie, dish, or if you are fancy your pie weights and bake bottom crust until golden brown. My trick for pie crusts: put all the ingredients in the freezer for 20 minutes before making so they are very cold. Also weighing down the crust during the initial bake prevents air bubbles. Mix mango slices, sugar, cinnamon, flour, zest and lemon or lime juice and pour into baked crust. Mixture should be moist but not wet. Roll out the other half of dough and fit over the pie. Crimp edges. 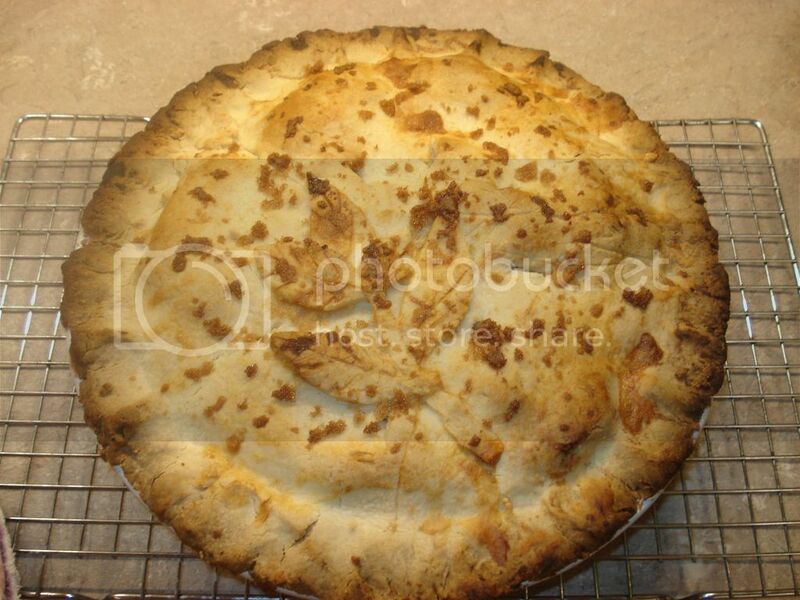 Bake pie 45 to 50 minutes until crust is golden and filling is tender when fork is inserted. For the mangos, get ripe but firm fruit. If they are too ripe the pie will turn to liquid. I can't believe people actually use Manwich when sloppy joes are so easy to make. My Mom always made her own sauce and I've since started...basically mixing up ketchup, mustard, Worcestershire sauce, BBQ, maybe some Heinz 57...basically mixing it to taste. We'll also add a little vinegar for bite. And add onions to the meat as it browns. I would advise that anyone making the Sloppy Joe recipe make it just like the recipe the 1 st time. With the ketchup and yellow mustard it has bite but you might want it more soupy , just add a little more ketchup .